The Opt-In Checkbox lets you collect participant consent. By default, every new Opt-In Checkbox element is a required field. You can place the Opt-In Checkbox element on any page (except "Thank You" or outcome pages). Simply drag and drop it on the Canvas. 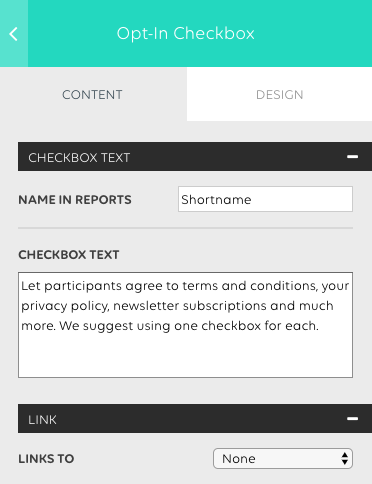 You can name each Opt-In Checkbox element for your reports. Just fill in a short name you can recognize when exporting your data. The caption is the text displayed right next to the Checkbox on the page. Scroll down to Options to change the behavior of the element. You can choose if you want to display a checkbox at all. This can be useful if you want to open a popup with text, but you do not need the checkbox. 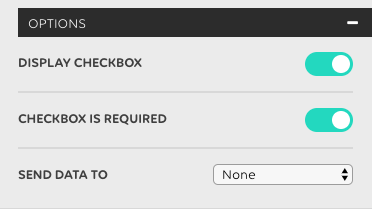 If you do not need consent for this particular checkbox, you can mark the field as not required. This should be the default option for a newsletter subscription checkbox. Select, what kind of Integration this checkbox should trigger, if it has been selected by the participant. Make sure to configure your Integrations afterwards, or no action will be triggered by the Opt-In Checkbox. Integrations are only available on our paid plans. You can find the participant Opt-In Checkbox answers just like any other answer when viewing detailed responses in the analytics or when downloading your XLS project report.